Everybody from MQTT beginner to expert needs a handy tool to try out stuff or for debugging. A while ago we had already taken a look at such tools, but since then a lot of new tools have emerged, which definitely justifies an update on that topic. 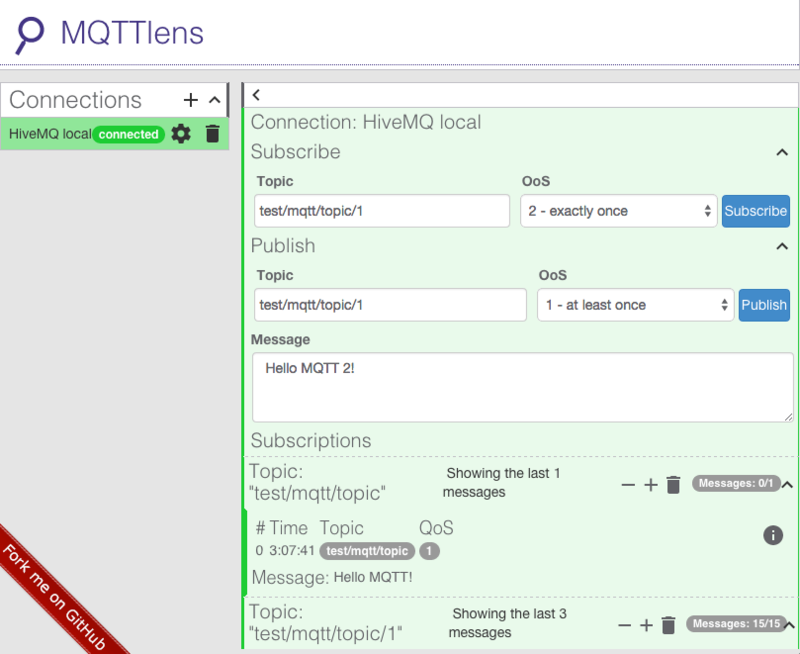 The goal of this blog post is to give a brief overview of the best MQTT client tools for different platforms and highlight special features. We from HiveMQ are very active in spreading the word about MQTT at conferences in Germany & Europe and to the whole world over the internet. So we often demonstrate and explain how MQTT works and what its benefits are. Also during the further development of HiveMQ and when implementing IoT solutions for customers, we need tools to publish and subscribe to different topics easily. These are only 2 use cases out of many others where a MQTT client tool comes very handy and is often inevitable. Due to the particular suitability of MQTT for mobile devices, tools for mobile platform are as important as desktop versions. So there’s definitely a right to exist for tools on different platforms and we will directly jump into our top 7 in no particular order. MQTT.fx is a fairly young tool, which is only around since 2014. It’s the new cool kid on the block, but has already built its fan base in our team. It comes with the portability of the Java VM and a quite impressive feature set. MQTT.fx is implemented with JavaFX, which is quite obvious, when opening the tool for the first time. Due to the native packaging available for JavaFX, there are binaries for Windows, MacOSX and Linux, which makes the installation a breeze. But lets have a look at the MQTT part. Besides standard publish/subscribe functionality it provides support for $SYS topics and connection profiles for connecting to different brokers. Especially the $SYS topic support is awesome, it helps to inspect the internals of the broker from time to time. We haven’t seen that kind of displaying in another tool. The connection profiles allow the configuration of connection options like client id, SSL/TLS, username/password and Last Will and Testament. Another functionality which has been introduced in one of the last releases is scripting. This makes the simulation of different sensors, etc. easily possible. Just for the record, there are also a few small things, which sometimes makes the user experience inconvenient. For example the publish/subscribe functionality is separated in two tabs, which results in constant switching the tabs. Update: It is possible to view publisher and subscriber at the same time by detaching one of the tabs. Also here and there small bugs occur. But regardless of these little things, the listed features makes it definitely one of the best choices, when experimenting with MQTT at the moment. mqtt-spy has been around since 2014 and as of early 2016 is part of Eclipse Paho and Eclipse IoT. It ships as a JAR file and runs on top of Java 8 and JavaFX. MQTT-Spy has a very nice way of displaying the basic MQTT publish/subscribe mechanism. It makes it easy to publish and subscribe at the same time and there are different tabs for connections to several brokers. The different areas of the pub/sub window (publish, new subscription, subscription & messages) can be closed down to make room for the currently used ones. 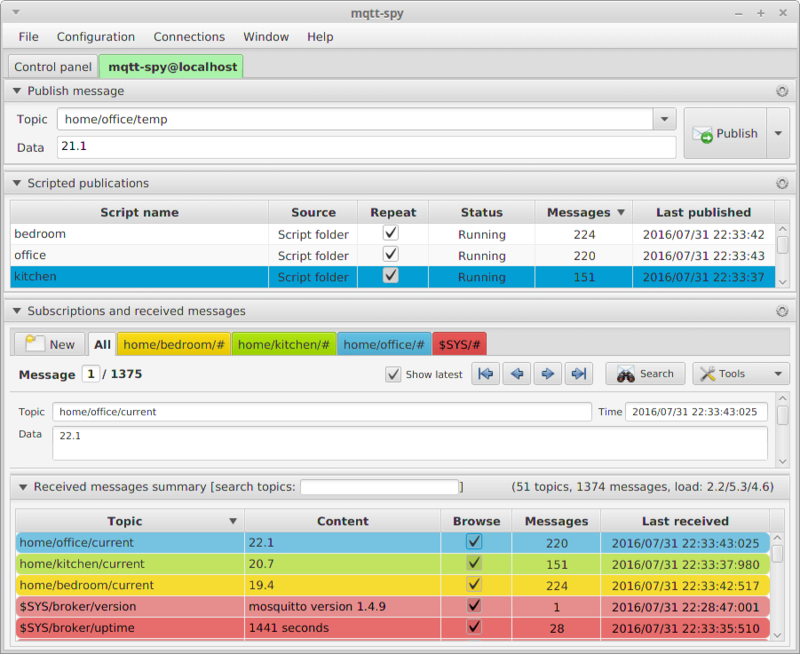 Its search functionality allows to find and filter the often heavy load of MQTT messages running through such a tool. Another handy feature is that it logs every published and received message in the standard output and also into a file. 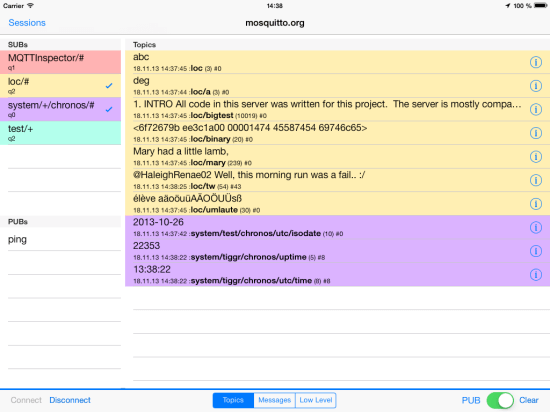 So it is easy to open the file in any text editor and make deeper analysis of the messages, which is often necessary when dealing with many MQTT messages. It also comes with advanced features like scripting, filtering & searching, decoding & formatting received messages and graphing/charts. It’s a sophisticated tool for the day-to-day usage. The MQTT inspector is a really great tool for any iOS device. It is especially suited for power users. It is possible to create and store connection options, similar to most of the other tools. But this tool also allows to pre-configure publishes and subscriptions as templates. After connecting to the broker a simple click activates a subscription or triggers a publish. Therefore it is good to know beforehand to which topics MQTT Inspector should publish or subscribe to. Of course it is possible to change this during an open connection. As a power user tool it allows to switch between a simple message feed, a view grouped by topic and a low level view.The low level mode shows low-level MQTT command messages and some basic data plus its representation in hex. Another functionality allows to filter the message by their topic, attributes or payload. This is very handy when a lot of messages arrive and only some of them are of interest. 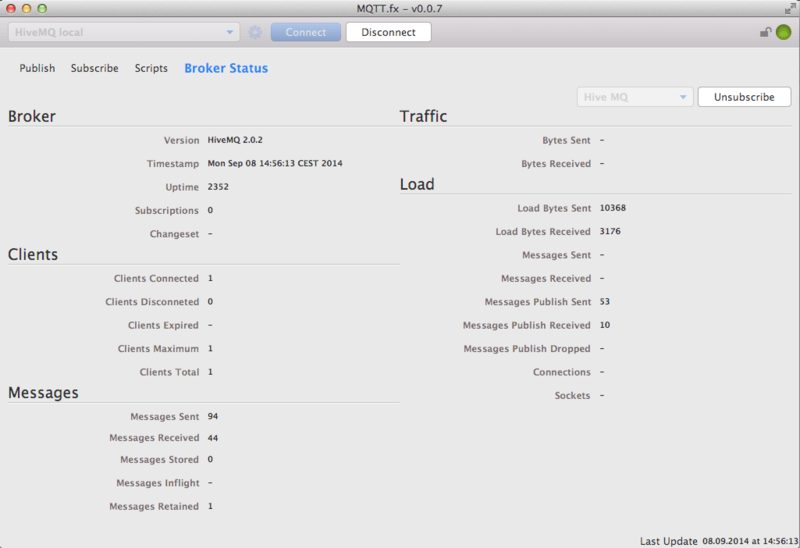 As soon as you have understood the handling of MQTT inspector there’s no way it wouldn’t make it onto your iOS device. The Android App MyMQTT can be installed via the Google Play Store. It is a useful app that has basic publish and subscribe capabilities. A functionality which differentiates this app from others is its ability to store messages on the phone. These are shown in the menu under “Stored Messages”. The app is still under development and essential features like different quality of service levels, Last Will and Testament as well as retained messages are missing. However, the last update is almost one year old. So hopefully the announcement of the new MQTT standard this September will bring a new version of this useful app for Android. Nowadays with all the fancy client tools, there’s still a place for the mosquitto publish and subscribe tools. They are still the best option on a headless server for verifying the correct installation of a MQTT broker and doing other MQTT tests. The feature set is complete and it is ideal for devops, power users or everybody else who loves to work with the console. To sum things up, since the last time we had a look at MQTT client tools, the MQTT tool landscape has changed a lot and there are some really great new tools to get started with MQTT and for everday use.